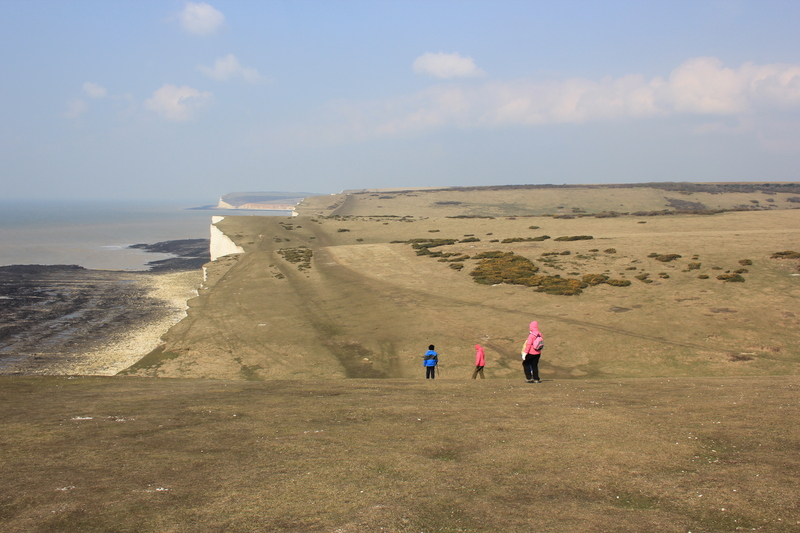 It is sometimes said that the Seven Sisters got their name because the land used to be owned by seven sisters. Michel Dene, the first valley when walking from east to west, has a monument which suggests otherwise. Its plaque states that Michel Dene was bequeathed to the National Trust by W A R Robertson, in memory of two of his brothers who were killed in the First World War. Perhaps there were seven sisters who owned the land back in time, but I doubt it. The landscape of the Seven Sisters is stunning. 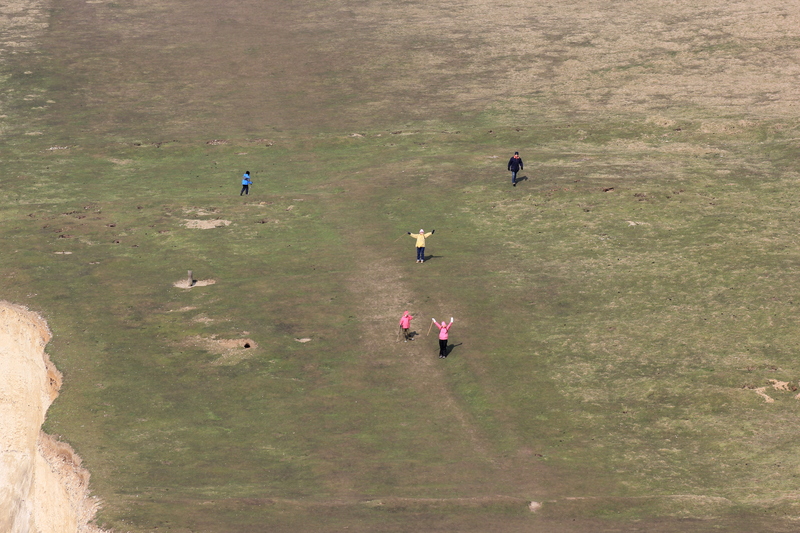 Beachy Head attracts far more visitors, presumably because a road runs up over the cliffs with numerous car parks. The Seven Sisters do not have such easy access. 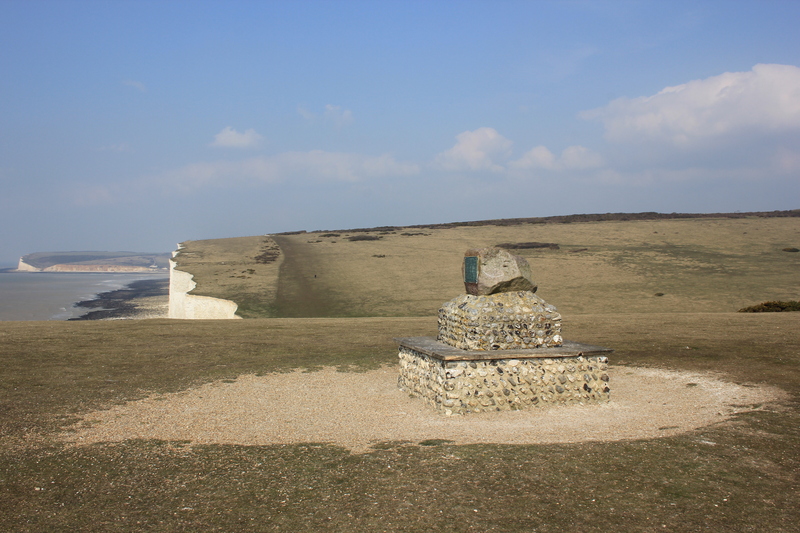 At the eastern end you have to park at Birling Gap and walk. At the western end there is no car park at all – the nearest road is a mile inland. It is the lack of access, I assume, which means there is far less foot traffic over the Sisters than over Beachy Head. I am glad of the more rugged landscape and the fewer people. It is a beautiful stretch of coastline. The views back were as good as the views looking forward, despite the haze. At Flagstaff Point (the fourth Sister when walking east to west) we saw a Sarcen Stone, set on top of a square bench. Sarcen stones are particular to the south coast of England. Around 40 to 60 million years ago, sediment formed by sand and silt became covered in groundwater which was rich in silica. Over time, the intensity of the silica increased, until the water could no longer hold it as part of a liquid solution. The silica solidified and filled the gaps between the sand, acting as glue to form a two metre thick band of rock across southern England. During the last 3 million years, and particularly during the last ice age, freeze-thaw cycles and water erosion broke this layer of sarcen up into boulders, leaving millions of them scattered across the landscape. Some have been put to good use. Go and have a look at Stonehenge if you don’t believe me. As for the Sarsen Stone at Flagstaff Point, it probably feels very much at home. The Seven Sisters were, after all, carved out of the rock by the erosion of glacial melt water. 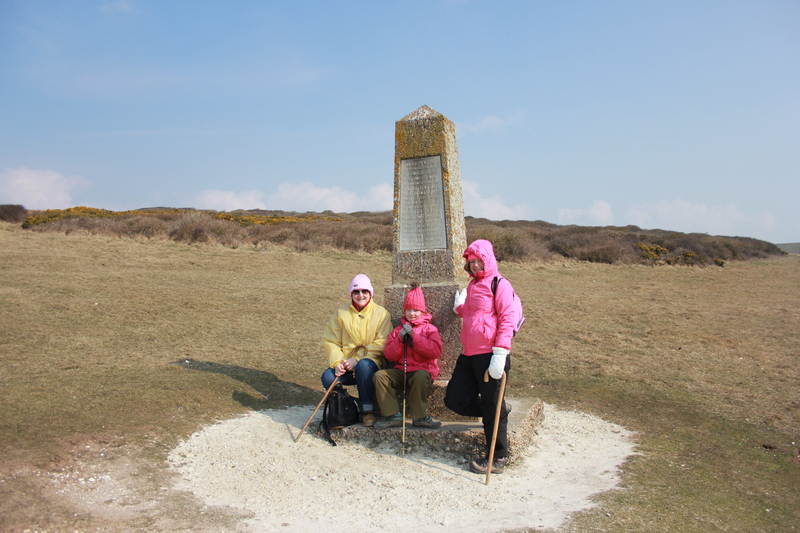 This entry was posted in East Sussex and tagged cliffs, coast, East Sussex, sarsen, seven sisters, travel, walking. Bookmark the permalink. It’s a lovely area. I remember going there on a geography field trip from school – a very long time ago. I think I’ve still got all the site drawings and notebooks.